Your home’s electrical service is one of its most important features and needs to be kept in shape. Any outlet or switch that begins to fail or look worn should be inspected and replaced if necessary at the first sign of trouble by a home electrical repair company. You may or may not know the details of the electrical circuit layout in your home, which is a consideration when you want to add a high-wattage device like a microwave, electric oven, or heater. All circuits are rated to allow a certain amount of power to be drawn, and exceeding this limit can cause the breaker to trip. If this is happening to you, you should call a home electric repair service like Houston Custom Carpets, one of the foremost remodeling companies in Kingwood/Humble. Electricity can present many dangers if not treated with respect, with exposed wires and faulty plugs being an electrocution hazard, and failing electrical insulation and short circuits a potential fire hazard, especially when they are out of sight behind walls. If you suspect your electrical service has a problem, we’re here to help. Many older homes may have wiring that is not up to code, and it’s much better to address the problem now than to find out later when trying to sell your house or something more serious goes wrong. Even if you plug in a new device and everything appears to be fine, certain appliances like refrigerators draw power in an intermittent manner, meaning the circuit can handle things one minute but trip later. In order to be sure your electrical configuration is the way it should be, get professional advice any time you are making changes. Certain appliances also need specialty outlets, such as larger AC units, electric clothes dryers, and electric ovens. We can also help if you need to add regular outlets. There’s nothing more frustrating than not having enough plug outlets or having them in the wrong place, especially these days with all the different devices we depend on. Don’t put up with trailing cords that become a tripping hazard when a simple shift or addition of a new outlet can make life so much more convenient. Having a tangled nest of extensions and power strips is not only unsightly, but also potentially unsafe. 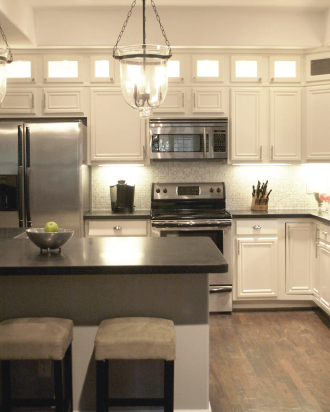 If you need help with your residential electric service or wish to add or remove an appliance, contact Houston Custom Carpets Flooring & Remodeling today for prompt assistance.